Add Google Analytics code directly into Blogger without manual insertion. 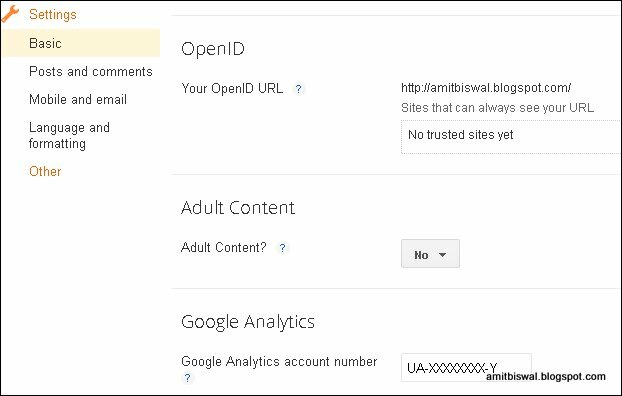 Now with the release of the new Beta version of blogger, now you can integrate your blog’s analytic profile in Google analytics easily without any need for the manual insertion of the code into your template’s HTML file. Basically this feature is boon for many bloggers who are not much tech Geek. This is because whenever you change the blogger template or upload a new customized template downloaded from various paid or free blogger template websites, you are required to insert the Google Analytics code into your template manually; otherwise you will not be able to track the traffic data and viewing patterns and demographics of your visitors. But the integration of Google analytics within the new beta interface has now made the task of tracking traffic stats much simpler. By this way you can automatically insert the tracking code in your template without doing any copy paste work manually. The main advantage that we found while using this feature is you don't need to worry about making manual changes in your template and you can freely change the design and template whenever you want to do so. Everytime you change the template, this feature will automatically insert the tracking code as many number of times as you would want. Go to your analytics account of the Blog that you want to be tracked. Now on the list of profiles, locate the main profile which is set your homepage URL. Now locate the right side of that profile listing under the “Actions” column. You will find there two options to chose from, the first one will be ‘Edit’. Click on the ‘Edit’ Link. On the upcoming page after you click on the ‘edit’ link. You will find another link on the top-right corner of the box named as ‘check status’. Click on the ‘check status’ link. On the next page, you will find your profile name and ‘Web Property ID’ which will be in the form of ‘UA-XXXXXXXX-Y’, where XXXXXXXX and Y are some numbers. Copy that ‘web property ID’. Now come back to your Blogger dashboard. Please note that you have to use the new Beta version interface to accomplish this task. If you haven't yet switched to the new interface then you can do it by clicking on the link for new interface which has been provided on the top-right corner of your blogger dashboard. From the ‘settings’ menu, go to the ‘other’ submenu. In the ‘other’ submenu, you can find the last option as ‘Google Analytics Account Number’. Just search for the tag </body> and insert the above code just before the </body> tag. But before adding that, ensure that the above given code or the previously inserted tracking codes are not already present in your template.